LERWICK, Shetland Islands, UK, September 23, 2010 (ENS) – We may have been forced by legal action to end our 100-hour occupation of Chevron’s giant drill ship, Stena Carron, yesterday – but that doesn’t mean we’ve given up trying to stop its journey towards a deep water drilling site off Scotland. Just hours after we removed our survival pod from the ship’s anchor chain, it left for a site in the Lagavulin oil field where it will drill an exploratory well in 500 metres of water. So this afternoon we sent out an actions team in inflatable speedboats to track Stena Carron, now in open seas 100 miles north of Shetland. 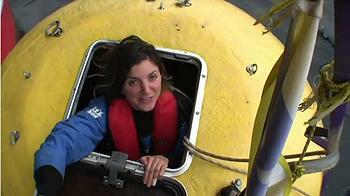 At 1.30pm they managed to put four swimmers in the drill ship’s path, forcing it to stop. Chevron has a tough task ahead to remove Greenpeace protesters from a drillship off Shetland after the campaigners Wednesday attached a “survival pod” to the ship’s anchor chain that could allow them to live on the vessel for up to a month. The action is part of the international environmental group’s Beyond Oil campaign. Inflatable boats launched from the Greenpeace ship Esperanza towed the eight foot diameter pod to the Stena Carron drillship anchored a mile off Shetland in Bressay Sound. Two climbers, Victor Rask and Anais Schneider, spent Tuesday night hanging above the waves in a tent suspended by ropes from the oil ship’s anchor chain before the pod was attached. 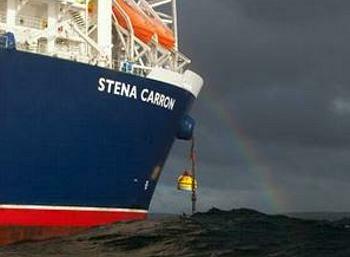 The 228-meter long drillship is operated by Stena Drilling and is under contract to Chevron. Deployment of the half-ton survival pod comes the day before environment ministers from countries bordering the North East Atlantic meet in Bergen, Norway to discuss a German proposal to ban new deep water oil and gas wells. Two activists, Timo Puohiniemi from Finland and Naveed Naz of the UK, say they are now “secure inside the survival pod,” where they are protected from the elements and have supplies to last for at least a month. The Greenpeacers today attached solar panels to the to ensure they have power to sustain their occupation. “That’s why we’re in this pod, hung in the anchor chain of a dangerous oil drilling ship just meters above the sea and equipped with supplies to last for a month,” said Deen. “The pod has everything you need, bathroom, kitchen, hospital … and housemates,” she said. “We will continue to block risky oil exploration until the government puts back a moratorium on new deep sea drilling,” said Deen. Northern Constabulary has told reporters that they will not remove the pod. The drill ship was supposed to be sailing for a site in the Lagavulin oil field before drilling an exploratory well in 500 meters of water in the Atlantic Frontier off Shetland, Greenpeace said. Some Shetland residents are critical of the Greenpeace action. “Please go home. You are endangering the lives of those on the vessel to which you are attached. You’ve just lost a Greenpeace Supporter and are TOTALLY out of touch with the? majority of people living in Shetland who obviously know more about deep sea drilling and UK safety measures than you do,” one resident wrote on the Greenpeace UK comments blog. Force 8 winds are considered gale force winds of 62 to 74 km/hour (39-46 mph).